The competition is on for Miss Universe 2017, and ET's rounded up everything you need to know ahead of the highly anticipated international beauty pageant on Sunday. When is the pageant, and where can fans watch? : The 65th Miss Universe Competition will air live from the Philippines on Sunday, Jan. 29, starting at 7 p.m. ET/PT on FOX. Who is hosting? : Despite his famous fail during the December 2015 pageant -- in which he mistakenly crowned runner-up Miss Colombia (Ariadna Gutierrez) as the new Miss Universe over actual first place winner Miss Philippines (Pia Wurtzbach) -- Steve Harvey is back to host the three-hour event, with Ashley Graham serving as backstage host. Who is judging? : Dayanara Torres, former Miss Universe from Puerto Rico; Sushmita Sen, first ever Miss Universe from India; Leila Lopes, first Miss Universe from Angola; Mickey Boardman, editorial director of PAPER magazine; Cynthia Bailey, founder of The Bailey Agency School of Fashion; and Francine LeFrak, Tony award-winning producer, social entrepreneur and women’s empowerment activist. Is anyone performing? : Yes! Legendary R&B group Boyz II Men will be taking the stage, as well as GRAMMY nominee Flo Rida. Who is competing from the USA? 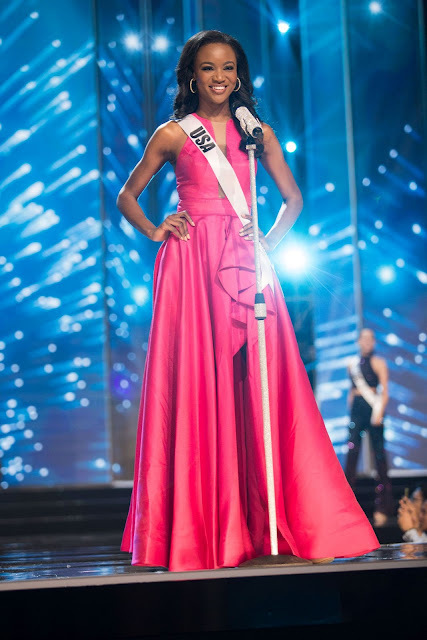 : This year's Miss USA is Washington, D.C. native Deshauna Barber, who is the first woman actively serving in the US Army Reserve to win the title. Who will take home the crown? : ET predicts it will be a tough competition between the 86 women from countries across the globe, but fans should keep their eyes on Miss Thailand (Chalita Suansane), Miss Colombia (Andrea Tovar), Miss Philippines (Maxine Medina), Miss Brazil (Raissa Santana), Miss Venezuela (Mariam Habach) and Miss USA. Do fans have any say on who should win? : Yes! Now through Saturday, fans can vote up to 10 times per day for their favorite contestant and help her earn a spot in the Top 12. Head to vote.missuniverse.com for more details! Best Instagram accounts to follow: In addition to all the Miss Universe content we'll be covering right here on ETonline.com, be sure to follow along on our social accounts, @etnow on Twitter and @entertainmenttonight on Instagram. For more up-to-the-minute updates, Instagram accounts @roadtomissusa and @pageantplanet never fail to impress us! As we patiently wait to see who will be crowned this year's winner, watch the video below to hear more on Harvey's hosting snafu.